The final instalment of the Pellinor Quartet, by the time I got to this book, I was looking forward to finding out what happened next. Croggan has been accused of plagiarism and indeed here you often get the feeling that what is being played out in the book feels like a repetition of something that has happened before. Croggan has answered these accusations here and acknowledged that she owes a debt to the likes of Tolkien and even Hans Christian Anderson, but has used them only for inspiration and has not plagiarised their writing. In this last quartet you find that the threat to the land of Edil-Amarandh by the evil king Sharma, or the Nameless One, has finally become real as he emerges from his kingdom in the South and begins to lay siege to one kingdom after another, laying waste to the great cities and destroying everything in his path. Our heroine Maerad is searching for her brother Hem who is thought to be in one of the cities which has been destroyed. She also knows that time is running out for her to stop Sharma and that she must find the mysterious Treesong in order to do so. She soon finds her adopted city under siege and herself at the heart of battle. One key difference I found between this book and Tolkien’s and other fantasy novels is the way the women characters are developed. Maerad is a complex, confused, flawed character. Many of the key players in this story are women – great bards (mages), elementals (nature spirits), warrior queens and hulls (bards who become evil). They are not just pretty girls who fall in love with heroes, but heroes in themselves. The other women fighting at the gates of the city alongside Maerad are portrayed as equals to the men. I didn’t enjoy this book as much as the second and third which were very enjoyable. The ending was almost an anti-climax and the conclusion of Maerad’s relationship with Cadvan almost an afterthought. 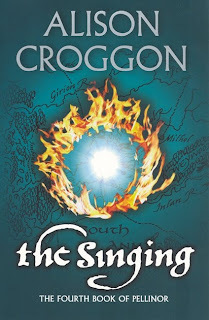 Croggan has still created a fascinating and rich world however, with its own history, languages, races and kingdoms which makes the series an enjoyable read and this last book a good-enough conclusion.